Love the location, walking distance to town and yet private! Casa Gallo was the perfect place for our group of friends. Right on the beach with amazing lounge areas, a great deck and kitchen. The bedrooms were lovely and clean and the staff was amazing. Thanks for sharing your beautiful home with all of us! Six of us recently stayed at Casa Gallo for a mother/daughter trip and we could not be more pleased with the accommodations! The bedrooms are all spacious, the outdoor living space is enormous, and the kitchen was fully stocked from coffee mugs to frying pans. The house manager Lucy is attentive and helpful and Vicki showed up every morning with a smile on her face and kept the house the cleanest rental I have ever stayed in. All six of us would highly recommend a stay at Casa Gallo! Our stay at Casa Gallo was incredible! We had a large group of family and friends, and there was plenty of room for all. We loved how open the home was and that the sound of the ocean could be heard from our bedroom. Lucie and her cleaning staff were very attentive and kept the home spotless throughout our stay. We enjoyed the pristine beaches and the private location of the home. Ross was extremely accommodating and responsive to requests prior to the trip. We will most certainly be back! House was large enough for our group, great location on the beach, could walk to town. Great facilities, well maintained and excellent service. We recently enjoyed a luxurious and relaxing week vacation at the gorgeous Casa Gallo and Casita Del Mar. 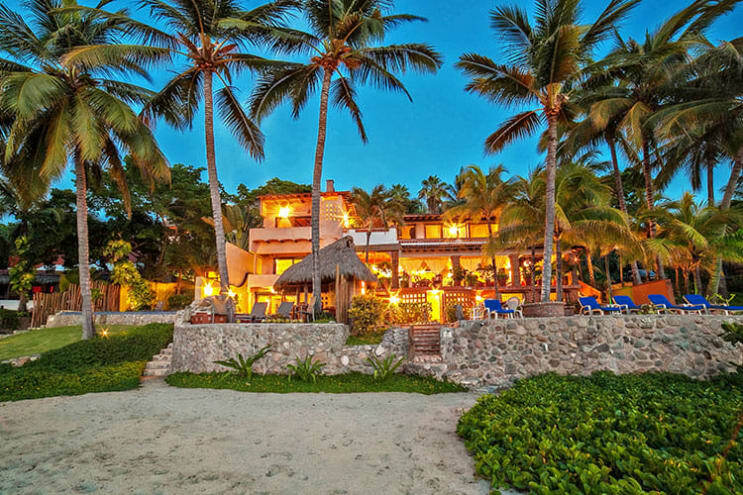 This is in a picturesque Mexican setting, oceanside with amazing views of the open water, the long sandy beach, crashing waves and the town of Sayulita can be seen along the beach. The rooms were all clean comfortable and cool with air conditioning in each room. The rooms were secured with locks on the doors and a safe in each room. The pools were clean relaxing and refreshing. All kitchen amenities were available so that we could cook at the house. The main kitchen and living space can be opened up and together with the large deck provide an indoor outdoor feel. It is a short five minute golf cart ride into town, easy, convenient and fun. The staff were responsive and helpful with any and all questions throughout our stay. We cannot wait to come back and will definitely return to this beautiful vacation home again! This place was so amazing. It was beachfront with a perfect pool, and lots of rooms and beds for everyone. The beach out front isn't great for swimming with the rips and the waves, but perfect for dipping toes, or for adults to bodysurf. The pool was incredible. There are 3 distinct areas- one for wading (great for my 2 year old), a slightly deeper one, and another section that is pretty deep. Lots of seating around the house, and pool too. The kitchen was stocked with everything we needed and more. Drinking water is provided. The staff are great too. They come everyday except Sunday. For little kids (1-3 yrs), this place can be a bit dangerous with steep drop offs on the main floor, on the retaining wall by the beach, etc. But we just stacked some furniture by those drop offs to keep the kids away from it. Also, for the little ones, the floor is very slippery and we had to keep shoes on the little kids when there were at the house. We rented a golf cart, as recommended. We actually tried to go without the golf cart, but found it was impossible with our small kids (2 and 4). The walk to the town is an easy 10 min away, but with small kids it was 20-25 min in really hot weather. The golf cart was kind of expensive- $50 usd a day (more than a car), but we definitely needed it. The only downside was that we were there in low season/rainy season (end of June) and there were tons of mosquitos in the rooms at night (even with closing the doors before sundown). The doors aren't 100% sealed so they get in at night under and above the doors, and maybe from elsewhere. So we got tons of bites, and there were no mosquito nets around the beds. So bring lots of mosquito repellent especially because there is malaria in the area now. Other than that, it was such an amazing place to be! For your security, we accept credit cards via Paypal with a 5% Paypal fee, and wire transfers to our US bank account. We also accept CAN e transfers with a 5% fee. 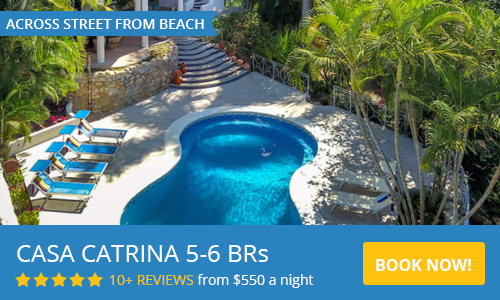 Beachfront Casa Gallo 4 bedrooms/3 bathrooms and sleeps up to 10 people. Includes daily housekeeping service. Please use the contact form to get in touch with any questions and to arrange your stay. We look forward to welcoming you to Sayulita!